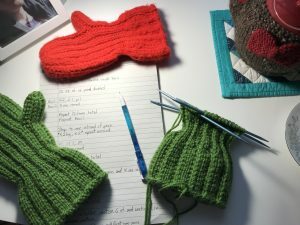 For a blog called Teish Knits, there’s not really much knitting content. Today I’m going to add a bit more knitting to Teish Knits, and I’m also offering my first free pattern download! Back when I was in elementary school, we won’t discuss just how many years ago that was, a Sunday School teacher of mine knit me a lovely, thick pair of red mittens. I’d never had knitted mittens that were this thick and warm, and they kept my hands nice and toasty through endless sled runs, snowball fights, and snowman constructions projects. Naturally, I did outgrow them, but Mom held onto them and tossed the mittens in her basket for knitted winter wear. When my kids came along, some of those items resurfaced, and my middle son took a particular shine to those red mittens! I’ve looked for a similar pattern a number of times over the year, to no avail. I didn’t list a gauge in the pattern, so just pick whatever worsted weight yarn you like and choose needles that will give you a fairly thick, stiff fabric when knitting the yarn doubled. Don’t worry if the first pair isn’t exactly the size you wanted, they’ll fit someone! After knitting a pair, you can play with the yarn, needle size, stitch and row count, etc. to customize the mittens. I’m assuming that anyone using the pattern has a familiarity with knitting in the round, and mitten construction experience will be helpful too. If you find any typos, or have any questions about the pattern, please don’t hesitate to contact me via my website contact form. Just click on the link below to download the PDF. You may download and use the pattern for your own personal knitting. Please do not sell the pattern, or download and repost on your site. Do feel free to share the link to this blog post though so that other knitters can download their own copy!